Yes, college costs will change by the time your children are ready to enroll. But working toward a poorly defined goal is one of the best ways to produce well-defined stress. Collegeboard’s annual survey, “Trends in College Pricing”, is a great place to start. The survey breaks down costs based on type of school (public, private, in-state, etc.) and into categories of tuition, room and board, books, and supplies and transportation. On Petersons.com, you can also find detailed information about the total cost of college attendance—stuff like tuition, books, fees and living expenses—for thousands of colleges and universities. –The 529 Plan. No matter when or how much you invest, the money in a 529 fund grows tax-free as long as it’s used for qualified higher education expenses. That’s an excellent incentive for parents. Another great benefit is that anyone—grandparents, relatives, anyone!—can contribute to your child’s 529 plan. 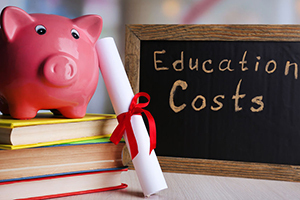 –The Coverdell Education Savings Account grows college funds tax-free, but you can contribute only $2,000 a year per child, and only if your joint income is under $190,000. –UGMA/UTMA Custodial Accounts aren’t always a top choice because they are counted towards a student’s assets, which can lower the amount of financial aid you’re offered. Another potential risk is that at age 18 or 21, your child has full access to the funds and can use the money on anything she likes, which might mean surfing in Cancun over science at Cornell. –Creating your own savings plan for college. You won’t get any special tax breaks, but this may be the best way for some people to take the plunge. Simply create a separate investment account in your name and set up an automatic monthly deposit. This simple act can start you on the discipline of saving to meet your college saving goals and add flexibility to your college savings plan. Volunteer as a family. Make donating time and money a part of your family values and lifestyle. Look for volunteer opportunities geared to children. Encourage a range of interests. Expose children to as much as you can: French lessons, karate, pottery, calligraphy, fencing, ballet and whatever else catches their eye. You never know what area will spark a lifelong passion. Start thinking about higher education. How was your college experience? What do you want for your children? What don’t you want? Begin to educate yourself by exploring the range of college choices and costs. For detailed and practical 529 plan information check out www.savingforcollege.com.